The 2007 college football season is winding down, and while the last of the autumn leaves falls lazily from the trees in Charlottesville, VA, there's no slowdown for Erik Elvgren, senior producer and animator at the University of Virginia's Athletics Video Services Department (AVS). 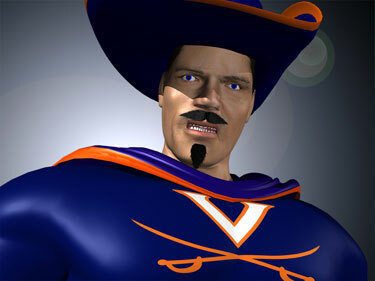 The last home UVA football game is only days away, and while Elvgren's animated CavMan adventures make their final 2007 showing at Scott Stadium, basketball season is already heating up, and CavMan is expected to pull duty for the Cavalier basketball team as well. For the uninitiated, picture the following: before kickoff at each home game, the Scott Stadium crowd turns their attention to the enormous "HooVision" screen for the adventures of CavMan, a fully three-dimensional character based upon the signature Cavalier mascot. Depending on the opponent, CavMan vanquishes a different foe before mounting up for a virtual gallop down the streets of Charlottesville and through the stadium tunnel, timed to coincide with the appearance of the actual mascot and horse charging onto the field. The crowd goes wild, the team is fired up, and the stage is set for a spectacular afternoon of football in Central Virginia. But like so many other things in Elvgren's world, the CavMan sequences have evolved dramatically. "Our fans have come to expect a different CavMan for every [game]," Elvgren explained, so gone are the hand-keyframed sequences done against static photographic plates in Hash Animation:Master. New CavMan adventures take place in a fully 3D "battledome," with CavMan and his foes modeled in NewTek LightWave 3D and animated in Autodesk MotionBuilder, using motion capture performances given from UVA students. "This year we're switching up and getting rid of the ride [to the stadium]," said Elvgren. "We're shortening it up a bit and making the battle a little more intense. We're doing it all 100 percent CG. It gives us an opportunity to be much darker with our lighting, much more dramatic. It also gives us the advantage of being able to do really fun camera moves." And it's not just the look of the CavMan adventures, but also the volume that has changed. CavMan segments have more than doubled from six (the usual number of home football dates) to 14 for this school year alone, counting the sequences created for selected home basketball dates as well. The evolution of CavMan in a very short amount of time is but a microcosm of what has happened over the last few years for Elvgren and the folks at AVS, and the catalyst for much of the change arrived in the form of the construction of UVA's new crown jewel: the $129.8 million John Paul Jones Arena. Completed in 2006, the 15,219-seat JPJ (as it is already affectionately known) has been the talk of the town, home to not only UVA's men's and women's basketball squads, but also host to an eclectic group of national acts that range from The Red Hot Chili Peppers to Disney on Ice. For Elvgren, intimate familiarity with JPJ began several years ago, when the arena was little more than plans on paper. Tasked with creating a 3D visualization of the entire arena for prospective donors, Elvgren soon found himself in unfamiliar territory. Not only had he not done an architectural project on the scale of JPJ before, it was the first time Elvgren found himself working closely with actual architects. "What I found out through this whole process," Elvgren recalled, "is that [the architects] constantly change the design and the look--what the chairs are going to look like, what the carpet is going to look like--and the animator is often times the last one to know when changes are made." But after more than a year of modeling, surfacing, and lighting the virtual arena to accurately reflect the ever-changing interior (and with a little help from a LightWave instancing plugin to handle the 15,000+ seats), the physically-accurate visualization was finally ready. The model was then converted to 3D Studio Max format and transferred to the Seats 3D company, where it is still used today to visualize seat locations. 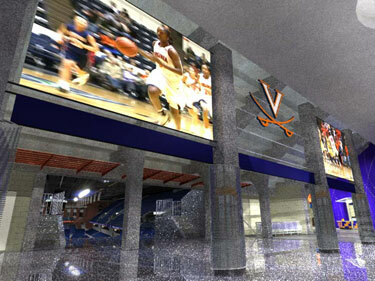 As ground was broken and construction begun, it was clear that video needed to take center stage, not only for events taking part inside the arena, but for many of the 25 men's and women's varsity sports at UVA. 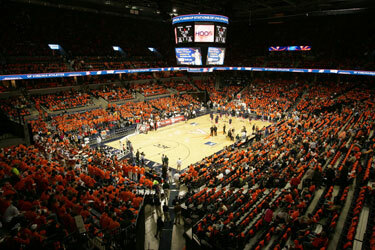 Consequently, the home of AVS had to function as both the nerve center during home basketball games and the video production facility for many Cavalier sports. As such, the department wanted to make sure they got their facilities right, and for that they needed some additional perspective. Since the John Paul Jones Arena shared one of the architects that worked on the University of Maryland's Comcast Center, it turned out that the two buildings also shared similar internal features, so a road trip to chat up both the university's production staff, as well as ESPN engineers, was in order. "We went up to the University of Maryland for one of the games, and we talked about what [they] like about the building--and what could have been done better--so we could avoid some of the up-front planning issues," Elvgren said. NBA arenas also provided some guidance for the LED signage and video boards AVS provided content for. Venues such as Dallas' American Airlines Center and San Antonio's AT&T Center were good test cases for what the signs and boards could add to the game atmosphere, with the San Antonio arena being particularly helpful owing to its smaller-town, almost collegiate feel. 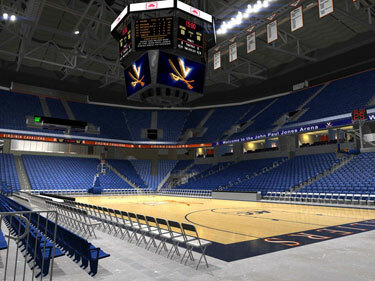 In the end, JPJ sports LED signs covering nearly the entire circumference of the arena's bowl, as well as the concourse and vomitory entrances, in addition to a two-ring, 12-screen (eight lower and four upper) main video board to display live action and stat data. In the heart of the AVS space lies the control room, which is a crucial piece of the puzzle for three distinct reasons. One, unsurprisingly, it's the command center for live events at JPJ. Two, it also serves as the control room for live events at two other nearby UVA venues: Davenport Stadium, which hosts baseball games, and Klöckner stadium, home to both the men's and women's soccer and lacrosse squads. (Construction allowed for the installation of fiber to the two additional venues; Scott Stadium, which hosts UVA football games, was prohibitively far and still requires a remote truck for live events.) Lastly, the space is also designed to be the production and storage facility for any additional UVA sports requiring video services, which range from putting together recruiting videos to providing game footage to coaching staff. As was the case with the LED screens scattered throughout the arena, consultants were key in helping spec out the equipment for the AVS control room. "We used our consultant to make the initial equipment list, and then we went over it," Elvgren explains, "but by and large, for most of it, we just relied on [outside] expertise, and that served us really well." Consequently, JPJ in general and the control room in particular is a veritable smörgåsbord of video production equipment: EVS replay systems running Dixon Sports software, Avid Deko 550 and Deko 1000 systems for CG, Grass Valley Turbo DDR for live game feeds, 360 Systems Image Server 2000 Broadcast Video Servers, a host of Clear-Com communications products and Tally routers, Hitachi 4000 cameras, Macintosh-based Final Cut Pro editing systems, DirecTV feeds to the suites, and more. When construction on the arena finally wrapped up in 2006, all that was left was to start actually using the new facilities and equipment to support the video needs of whichever of the 25 varsity-level sports required assistance. Today, the AVS team keeps busy juggling the many offerings that fall within their jurisdiction, with various services counted as part of their collective mandate. Live events are the most visible, of course, with AVS currently handling more than 100 live events a year for major UVA sports, as well as offering assistance on an as-needed basis to visiting acts. Other tasks include providing video for analysis by coaches and athletes, compiling clips for recruiting and highlight reels and special events such as sports banquets, a half-hour TV show produced 30 weeks a year, and re-purposing clips for Web delivery. Selected events are also offered as live feeds to the Atlantic Coast Conference, who then streams the feed to an international audience over the Web. All of this is in addition to various (and sometimes repetitive) graphic tasks such as compositing athletes' head shots onto motion backgrounds. Naturally, there are myriad challenges involved in supporting that much production, presenting a rapidly moving target as techniques, equipment, and demands evolve and grow. The first year of JPJ's existence was a constant learning situation for Elvgren and the AVS staff, requiring a healthy amount of trial and error in order to determine workflow and best practices. One of the major challenges is staffing. With only nine full-time employees, and with a dearth of experienced freelance help in the Charlottesville area, finding the proper manpower for a given event can sometimes present problems. Consequently, AVS relies heavily on a pool of 15 student interns, each giving at least 10 hours a week, to handle a great deal of actual production work--running cameras, editing footage, operating servers, etc. "Basketball's not so bad because games are [generally] in the evening or on weekends, but when you try to find someone for a 2 [p.m.] baseball game on a Tuesday, I'm glad we have some interns trained because we'd be out of luck otherwise," Elvgren said. "Our interns aren't just extra people to help out; our interns are people we put to work. By the end of the [school] year, they're basically employees." And there are always future considerations to think about. While the "trial by fire" atmosphere of the last year has produced many solutions, there are looming issues and changeovers to contend with. For example, AVS still produces much of its work in standard definition, albeit much of it at 16:9--football and the weekly show remain 4:3--and all if it digital. But the switch to HD is inevitable, and with so much video being generated, there's also the ongoing issue of archiving. Source tapes are logged and stored, with footage loaded into the Image Server 2000 for live events. "We hardly roll anything off of tape anymore," said Elvgren. "We load everything into the server and call it up. [But] one of the big things we're hoping to put it next year is a shared storage solution. We're not sure which one we're going with, but we're talking about getting something that will upgrade to HD. We're not HD right now, but we're all-digital 16:9 SDI, so we have a lot of thinking to do there." While there will always be challenges, the AVS environment provides enormous opportunities to learn and grow. Elvgren said he considers himself a de facto engineer these days, and often serves as such during live events. It's a sea change from his traditional duties as an animator, but Elvgren seems to be taking it all in stride, even as there is very little time to stop and catch his breath--sometimes literally. "The challenge to us is just managing the volume of workload, [but] I love the rush of live events. One of the things you have to get used to is how many times you have to run up and down stairs in this building. Suddenly, you've done six sets of stairs in an hour. It's a lot of work," Elvgren said, though not without a laugh.